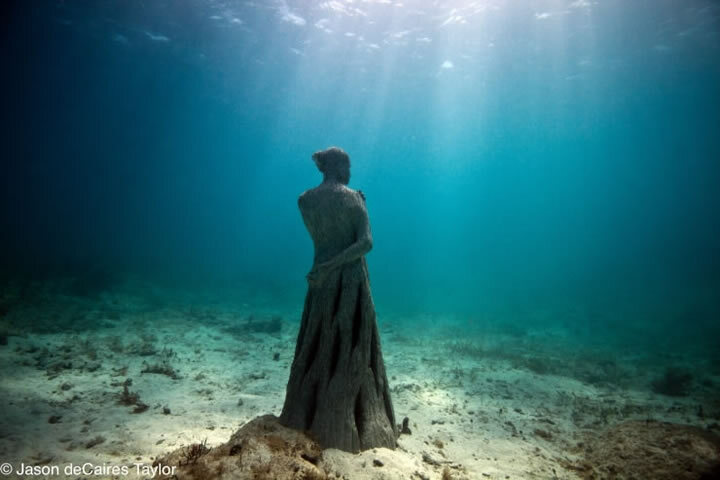 I discovered Jason deCaires Taylor’s sculptures today while I was looking up work by another artist. 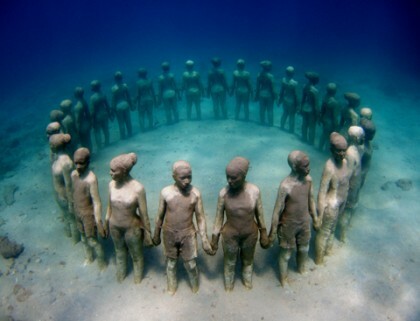 I immediately became distracted as soon as I saw the first image of his haunting work. 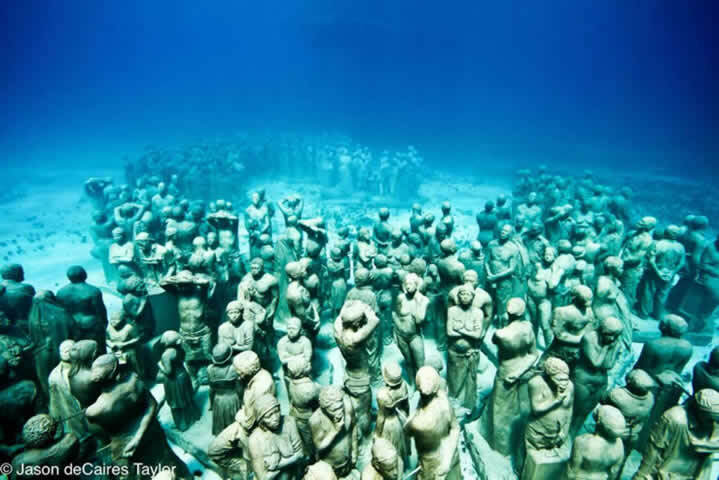 After going to his website, I could not stop looking at the images of his underwater sculptures. 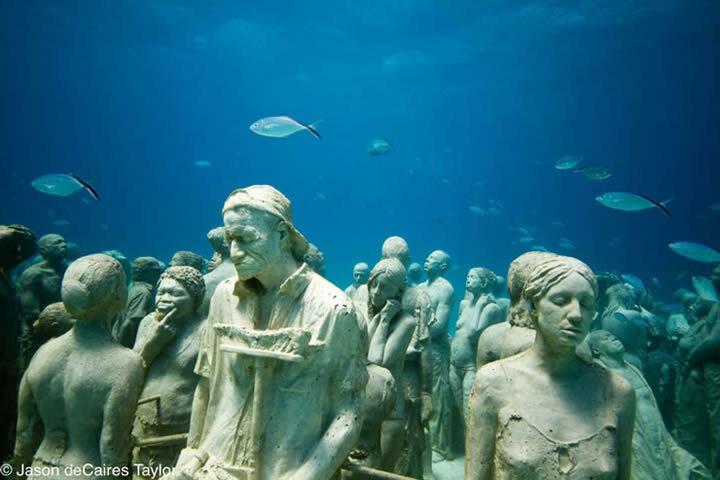 Part of me was repelled, part of me fascinated, as I am with the ruins of Pompei, or the wreck of the Titanic. 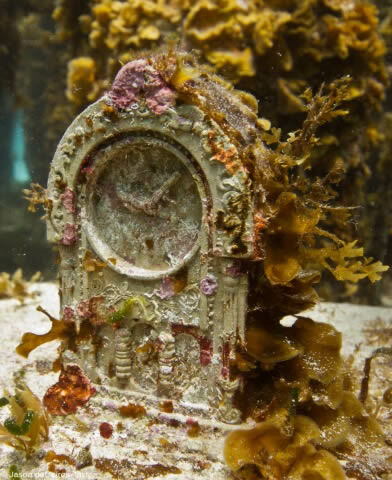 His work brought to mind for me concepts such as the passing of time and the concept of freezing time, individuality, community, natural disasters, humanity, death, life, dreaming and sleeping, community, God, eternity, the preciousness of details, and the mysteries of the lives of others. 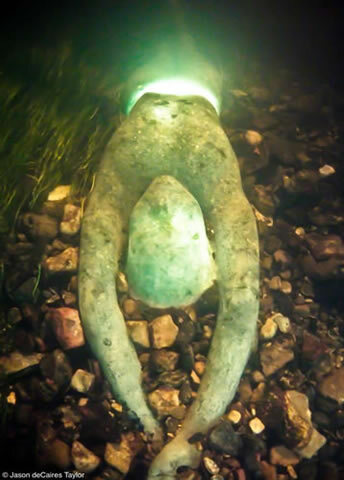 When you encounter these images, it is almost like you are discovering sleepwalking people that you want to awaken, or ghosts of lives not finished, or people turned to stone by the White Witch of Narnia and doomed to spend all eternity in the depths of the blue sea. 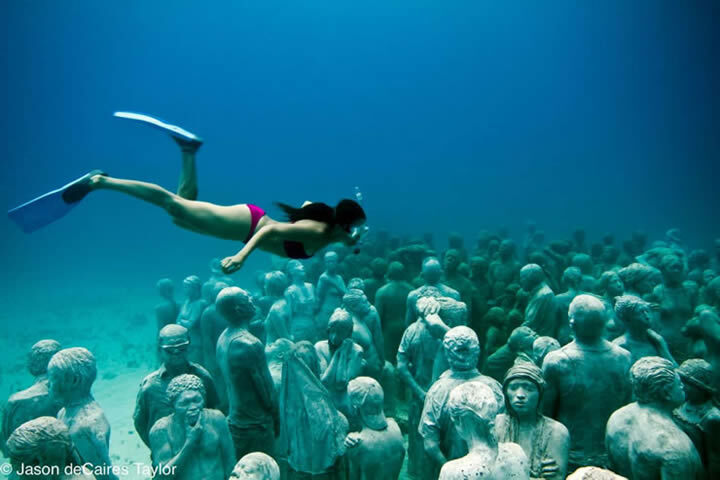 One almost can hear the silence, and one fights the urge to hold your breath as you look on these sculptures. There’s something about the figure used realistically in an artist’s work that draws you in emotionally. 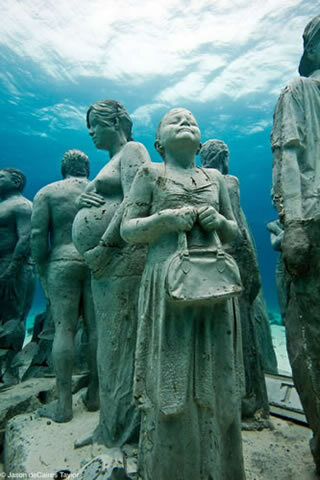 Quite honestly, I haven’t been truly moved by art in so long..perhaps because I have seen so much of it… but these sculptures are powerful enough to deliver emotion, whether one likes it or not. One strong emotion it aroused in me was the desire to rescue. 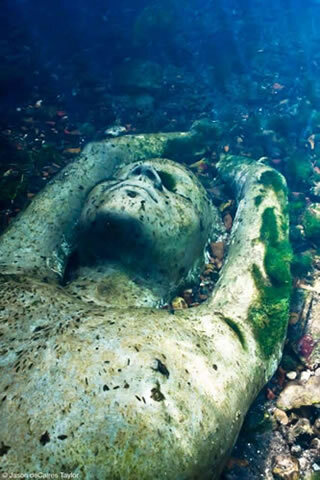 Don’t you want to wake these immobile stone sleepers, and bring them to the surface? It makes me want to bring them to shore to lead a full life of laughter and color and movement. Perhaps that is the strength of the art, to bring the viewer to action in life, to change thier view a little. 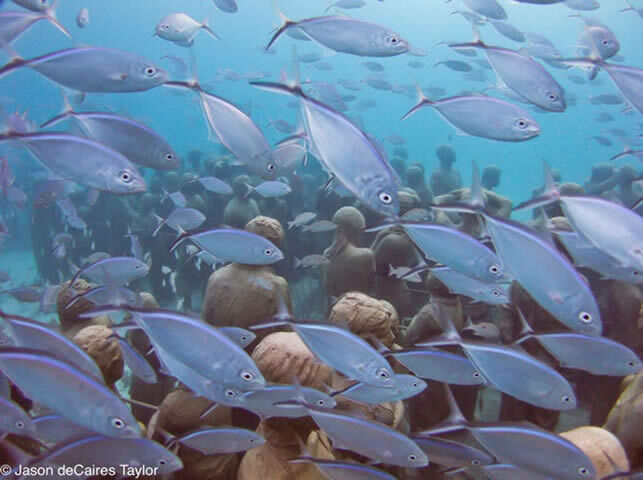 In reality, Taylor’s sculptures serve as more than objects of beauty and thought, they are also gardens that help spread natural coral reefs–the sculptures change as they grow underwater, and marine life take up residence among the statues. 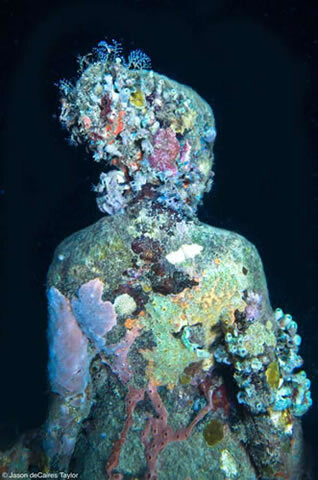 Some are decorated with coral growths of many colors and kinds, so they resemble a finely made haute couture dress on the figure. 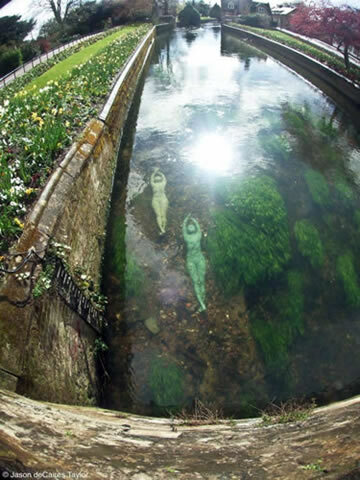 My favorite sculptures are the two women who appear to be swimming in a long pool, luxuriously enjoying the sunshine and the water, looking like nymphs of the lilies. They seem completely at ease and rest. This Biography was taken directly from the artist’s website, which you can see by visiting here. 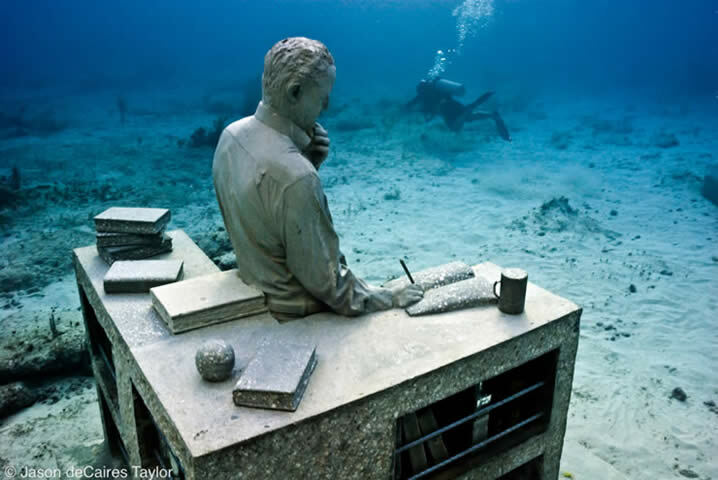 “Jason deCaires Taylor is a man of many identities whose work resonates with the influences of his eclectic life. Growing up in Europe and Asia with his English father and Guyanese mother nurtured his passion for exploration and discovery. 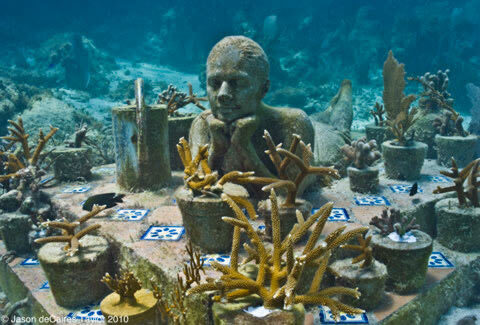 Much of his childhood was spent on the coral reefs of Malaysia where he developed a profound love of the sea and a fascination with the natural world. 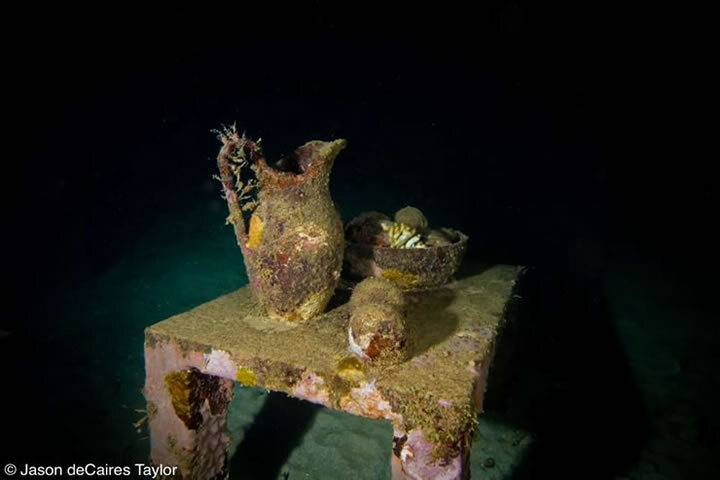 This would later lead him to spend several years working as a scuba diving instructor in various parts of the globe, developing a strong interest in conservation, underwater naturalism and photography. 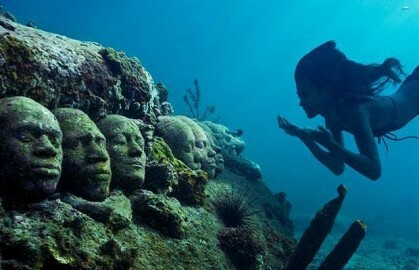 His bond with the sea remains a constant throughout Taylor’s life though other key influences are found far from the oceans. During his teenage years, work as a graffiti artist fired his interest in the relationship between art and the environment, fostering an ambition to produce art in public spaces and directing the focus of his formal art training. He graduated in 1998 from the London Institute of Arts, with a B.A. Honours in Sculpture and Ceramics. Later, experience in Canterbury Cathedral taught him traditional stone carving techniques whilst five years working in set design and concert installations exposed him to cranes, lifting, logistics and completing projects on a grand scale.